Starting June 2, viewers can expect a week of fan-driven, interactive episodes and giveaways. Episode 1 (Monday, 6/2): The audience will be made up exclusively of Twitter users who follow the show’s official feed @PriceIsRight. The hashtag #TPIRSelfie will be promoted to fans and audience members; pictures with that hashtag have the chance to be included in the CBS.com photo gallery. Episode 2 (Tuesday, 6/3): This episode features a live Facebook chat with model Rachel Reynolds from 11:00AM-12:00PM EST, as well as the kickoff for a Pinterest giveaway in which fans will have a chance to win a trip to Hawaii by clicking the image on the Price Is Right Giveaway Board. 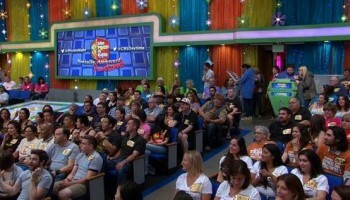 Episode 3 (Wednesday, 6/4): This episode will feature a unique Second-Screen Experience viewable on YouTube and PriceIsRight.com, broadcasted simultaneously with the show on TV. This will give viewers an exclusive look at what happens behind the scenes while the show is being taped live.